The St. Louis Cardinals both added to and subtracted from their 2018 big league roster in two trades made this past week at baseball’s Winter Meetings in Orlando, Florida. On Wednesday, the Cardinals made a deal that sent four minor league prospects, including two from the 40-man roster, to Miami in exchange for outfielder Marcell Ozuna. On the heels of the rejection by Marlins slugger Giancarlo Stanton to a trade to St. Louis, going to the Yankees instead, the Cardinals worked on and arranged for the acquisition of Stanton’s teammate. Going to Miami were right handed pitchers Sandy Alcantara and Zac Gallen, left handed pitcher Daniel Castano, and outfielder Magneuris Sierra. Alcantara and Sierra saw some big league time in 2017. 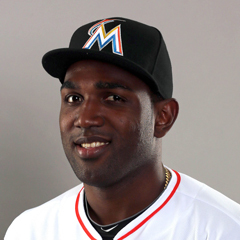 Ozuma had his best year last season with the Marlins, hitting 37 home runs and driving in 124 runs for a .942 OPS. The outfielder will enter his second year of arbitration, and brings two seasons of team control, becoming free agent eligible in 2020. Ozuna also brings Gold Glove award winning defense in left field. It is expected that Ozuna will play left field for the Cardinals, with Tommy Pham in center field, and Dexter Fowler in right field. To make room for Ozuna, the Cardinals sent last season’s right fielder, Stephen Piscotty, to the Oakland Athletics in exchange for two minor leaguers. The acquisition of Ozuna made Piscotty expendable, and the Cardinals made the trade to Piscotty’s home town team, and to the team of which he was a fan while growing up. Piscotty will be able to spend more time with his ailing mother, who was diagnosed with ALS this past May. ALS is a progressive disease that is 100 percent fatal, with an average survival rate of three years. That this was a consideration in where Piscotty was traded cannot be doubted, and it was a move that was widely praised throughout MLB. The 26-year old Piscotty was a first-round draft pick of the Cardinals in 2012. The pick came to the Cardinals as compensation for losing Albert Pujols to free agency. Piscotty made his debut with the Cardinals in mid-season 2015 and hit 22 home runs and drove in 85 runs in his first full season in 2016. Piscotty’s 2017 was not a good one, affected at least in part no doubt by the stress of his mother’s diagnosis. The Cardinals received minor league infielders Max Schrock and Yairo Muñoz from Oakland in exchange for Piscotty. For more detail on the two newest Cardinals prospects, click here (free article). To close the Winter Meetings on Thursday, the annual Rule 5 Draft was held. St. Louis was inactive in the Major League phase, neither selecting a player nor losing any. In the Minor League phase, second baseman Jacob Wilson was taken by Washington and the Cardinals added two outfielders, Angel Moreno from Tampa Bay and Jean Selmo from Arizona. Ken Rosenthal of FOX Sports and The Athletic tweets that the Cardinals are “pushing hard” for Blue Jays 3B Josh Donaldson, though Toronto is inclined to keep Donaldson, as they believe they are in a position to compete in 2018. Donaldson will become free agent eligible following the 2018 season. Multiple sources, including USA Today’s Bob Nightengale, have reported the Cardinals are interested in Orioles 3B Manny Machado, though the Cardinals reportedly have not made a formal offer to Baltimore. Buster Olney of ESPN writes that as of Saturday, the White Sox and the Diamondbacks have shown the most interest in Machado, who like Donaldson will become free agent eligible following the 2018 season. St. Louis has also been rumored to have had discussions with Tampa Bay about closer Alex Colome and perhaps third baseman Evan Longoria. At some point this off-sesaon, the Cardinals have also reportedly looked into free agent closers Greg Holland and Wade Davis. 12/14 The Cardinals signed free agent RHP Luke Gregerson. 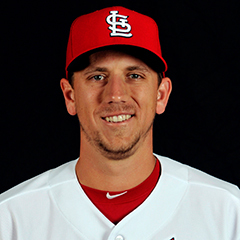 12/14 The Cardinals traded OF Stephen Piscotty to the Oakland Athletics for 2B Max Schrock and SS Yairo Muñoz. 12/14 The Cardinals traded RHPs Sandy Alcantara and Zac Gallen, LHP Daniel Castano, and OF Magneuris Sierra to the Miami Marlins for OF Marcell Ozuna. The Cardinals’ annual Winter Warm-Up is scheduled for January 13-15 in St. Louis at the Hyatt Regency Hotel. The annual Baseball Writers’ Dinner is scheduled for Sunday evening the 14th at the Union Station Hotel in downtown St. Louis. Tickets for the Winter Warm-Up and for player autographs are on sale now either online at Cardinals.com or at the Busch Stadium Box Office. Admission tickets are $40 for the three-day event. The annual Cardinals Caravan is scheduled in conjunction with the Winter Warm-Up. The Caravan will take place Jan 12-15, and there are six caravans scheduled. Caravans will traverse six states, Missouri, Illinois, Arkansas, Indiana, Kentucky, and Tennessee. Details can be found at https://www.mlb.com/cardinals/community/caravan . The 1975 Cardinals are the subject of this week’s blast from the past. 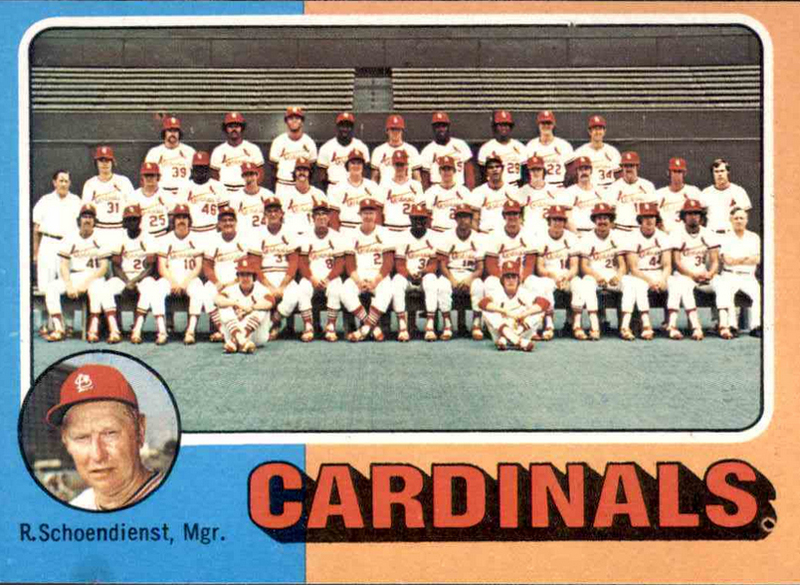 The ‘70s marked a period of middling Cardinals teams, with no playoff appearances for St. Louis in that decade. The 1975 Cardinals finished 82-80, tying for third place in the NL East with the New York Mets. It was the 94th season of the franchise. The manager was Red Schoendienst, and the General Manager was Bing Devine. The Cardinals were owned by Gussie Busch. The Opening Day lineup in 1975 was Lou Brock (LF), Ted Sizemore (2B), Bake McBride (CF), Reggie Smith (RF), Ted Simmons (C), Keith Hernandez (1B), Ken Reitz (3B), Ed Brinkman (SS), and Bob Gibson (SP). The longest losing streak was six games, from April 19-26. The longest winning streak was seven games, from June 2-9. The largest winning margin was a 17-2 laugher against the San Francisco Giants on May 17. The worst defeat was a 10-1 loss to the Cincinnati Reds on June 12. Home/Road splits were 45-36 at home, and 37-44 on the road. 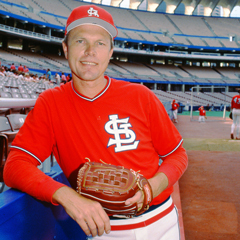 The top starting pitcher was Bob Forsch, who went 15-10 with an ERA of 2.86. The top offensive performers were Simmons, with a slash line of .332/.396/.491, 18 HR and 100 RBI, and Smith, with a slash line of .302/.382/.488, 19 HR and 76 RBI. 1975 also marked the final season of Bob Gibson’s career. Gibson spent 17 seasons as a Cardinal, his entire major league career. To this day, Gibson’s single season ERA record of 1.12 in 1968 has never been surpassed. Gibson won two Cy Young Awards and nine Gold Gloves. Lou Brock was the recipient of the 1975 Roberto Clemente Award, given annually to the player who “best exemplifies the game of baseball, sportsmanship, community involvement and the individual’s contribution to his team”, as selected by fans and media members.